SAN FRANCISCO, June 19, 2017– Long before Instagram and SnapChat made pocket-sized images of your favorite celebrity or sports hero a hot commodity, there was the trading card. Local artist Kate Haug was inspired by this vintage collector’s item for her Summer of Love-themed Art on Market Street Poster Series, which features the all-stars of 1967s counterculture and political scene. Allen Ginsberg, Bobby Seale, Janis Joplin, and yes, even Ronald Reagan, are just a few of the era’s icons that will appear in the bus kiosks between the Embarcadero and 8th Street through August 31 2017. From researching photo archives and the popular press, Haug came across a diverse representation of figures central to the San Francisco scene. Many people featured on the cards such as Joan Baez, Jerry Garcia, Sly Stone, Sonny Barger, Bobby Seale, Lenore Kandel, Allen Ginsberg, and Janis Joplin lived in the Bay Area, locating San Francisco as central to this historical moment. Card No. 29, Reverend Cecil Williams and Janice Mirikitani, celebrates the couple’s on-going social justice and humanitarian work at Glide, which was ignited in 1967 when Williams removed the cross from Glide’s sanctuary stating, “We all must be the cross.” Haug included Ronald Reagan as his form of conservative politics has had lasting impact on American history. 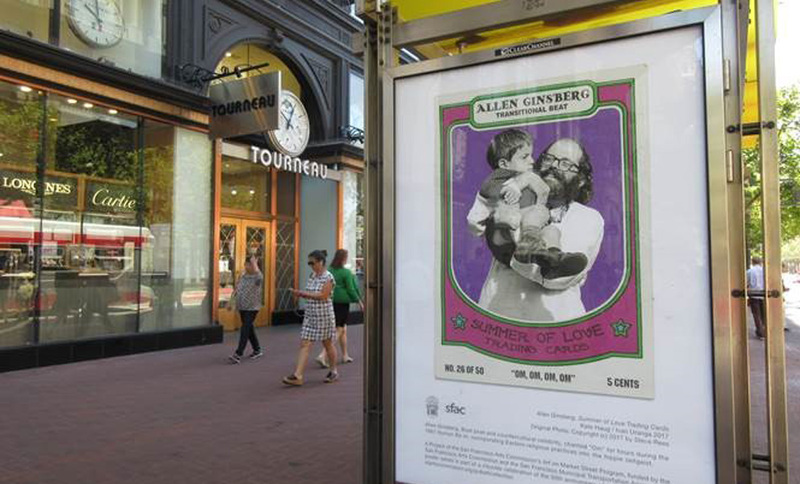 The next and last Summer of Love-themed Market Street poster series will feature new work by Sarah Hotchkiss who will examine the “diverse Bay Area political, cultural and social scenes of 1967” through local mainstream and underground media. For more information about the Summer of Love anniversary celebration visit Summerof.Love or SummerofLove2017.com.